Here at Climate Interactive, we see system dynamics in two ways. First, system dynamics is a perspective. We use this method to look for interdependencies, hypothesize how the structure or interconnectedness of systems drive their own behavior, and inquire about root cause drivers of society’s challenges. 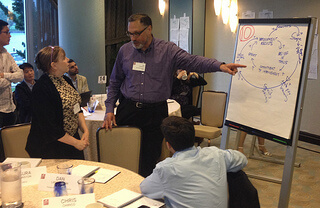 CI partners explore a causal loop diagram of a business and sustainability challenge. Second, system dynamics is a mathematical modeling and diagramming method that provides a useful framework for working with our partners. The System Dynamics process typically consists of creating system maps and then rigorous mathematical computer simulations. More technically, the simulations are high-order non-linear differential equation models, emphasizing feedback and stock-flow effects. System dynamics simulations help people see what works to improve systems so that they work better for everyone, by allowing people to test many alternative actions or investments and see how they play out, given the feedbacks, interconnections, delays, and non-linearities of the system. We use system dynamics simulations in three ways. First, partners and clients incorporate what they learn from our simulations to design better policies. Also, we put simulations online with an open source license, reaching much larger audiences. Finally, we embed the simulations in interactive sessions and research programs in which diverse partners can explore long-term scenarios in fractions of a second and often play roles of various stakeholders in the system to accelerate and deepen learning. System Dynamics was invented in the 1950s at MIT Sloan by Professor Jay Forrester and builds on several different strains of systems sciences. The best textbook on System Dynamics is Business Dynamics: Systems Thinking and Modeling for a Complex World by John Sterman. The classic and original textbook is Industrial Dynamics by Jay Forrester. A good, less technical overview is Thinking in Systems: A Primer by Donella Meadows. A broader text that connects systems thinking with the field of organizational learning is The Fifth Discipline: The Art & Practice of the Learning Organization by Peter M. Senge. The System Dynamics Society is here.